The Real Stone Cold Truth! There is so much misinformation in the media these days, that it is hard for even political pundits and couch potatoes to sift through and even try to understand it all. No more is this true than with regard to Roger Stone, a former political consultant and now host on Infowars who, along with his buddies Paul Manafort, Rick Gates and others long ago founded or played a role in the firm of Black, Manafort, Stone and Kelly. While I do not wish to cast aspersions on Charley Black and the others in this days-gone-by consulting and lobbying firm, which played a role in the election of George H.W. Bush and other Republicans, Roger Stone's downhill evolution since these early days has gone from what was billed as a legitimate political operative to a self styled dirty trickster whose heroes include the infamous Roy Cohn and Meyer Lansky, played in the "Godfather" by Hyman Roth. Just watch the Netflix documentary "Get Me Roger Stone" to see what I mean. Roger, to many who don't know who he really is, can seem to be an engaging figure. In fact, you can read about him in my autobiography "Whores: Why and How I Came to Fight the Establishment," published in 2009 but written years earlier after my 2003-2004 campaign for the U.S. Senate in Florida. The book is still available at www.wnd.com, www.amazon.com and www.barnesandnoble.com, among other on-line booksellers. In it I chronicle how Roger, who for a few short weeks was, along with the ethically challenged friends he brought into my campaign with him, such as his "yes man" Michael Caputo as an alleged press secretary, was my campaign manager. While I admittedly in retrospect made a huge mistake in asking him to help me be elected senator from Florida, my home state, when after a few weeks my other staff and I saw that he was exploiting me and failed to disclose that he was also shamelessly representing Al Sharpton, who then wanted to run for president, we parted ways. And when Stone left, his friends like Caputo, having already milked me of personal funds that I had committed to my campaign, took tens of thousands of dollars of computers and cell phones which I had personally paid for. To this day, I have never recovered from this financially and at the time it certainly destroyed my chances to be elected senator. I chose not to sue Stone then, because I tried to remain focused and not be diverted with my prospects to becoming senator. But from that point forward, I never wanted to have anything to do with him! When news of Special Counsel Mueller's investigation first broke a few years ago, knowing of Stone's relationship with President Donald Trump, I remarked to a number of colleagues how I thought, knowing Roger's "proclivities," that this would spell trouble down the line for The Donald. In fact, Stone, obviously for profit and to further his own egotistical grandstanding, boasted that he could get a pardon for my client Cliven Bundy. He even flew out to Nevada to try to enmesh himself in the criminal trial. At the time, I warned the Bundys to stay away from him, as "bad news" which would only be used to further unjustly harm their reputation. I also did not want Stone to exploit them as he had done with me. There were other instances where Stone, like a vulture, tried to figuratively pick the financial flesh off of other high-profile clients I was representing. I also successfully warned them to stay away for their own good. Roger, in my opinion, was a disaster waiting to happen. And, sure enough the Stone Cold Truth, the name of Roger's show on Infowars, has now taken on a "special counsel meaning." The "truth" is that just as I warned my clients, his desire to tie himself publicly to the president, creating the false mystique for his own ego and financial pursuits that he was the main reason Trump was elected, has given rise for the left to use this as a wedge against Trump. In effect, the charges against Stone, lying under oath and threatening material witnesses, such as Randy Credico, are being used to tar our great president. It's commonly called guilt by association. For the president the wise valedictorian speech and words of comedian Rodney Dangerfield in his classic film "Back to School" ring true: "Look out for number one and don't step in number two." And, it was for this reason that Donald Trump attempted to create an appearance of distancing himself from Stone both during the campaign and thereafter. It sadly did not work. 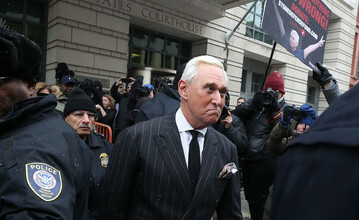 In recent weeks, trying to deflect first from the prospect of being indicted and then actually being indicted by the Special Counsel, Stone has gone on a public relations campaign to smear and defame my brave client Dr. Jerome Corsi, who unlike Stone told the truth to the Special Counsel and other government authorities, and did not threaten witnesses. For this obvious reason, Jerry, who is Person 1 in the Stone indictment, was not charged with any wrongdoing. While the Special Counsel and the grand jury effectively named Dr. Corsi as a material witness to what will now be the ensuing prosecution of Stone this summer or fall, this was not Jerry's doing. Jerry has never said that he is "happy to testify" against Stone, a falsehood principally whipped up by one of Roger's surrogates (like the more than low class Cassandra Fairbanks who recently defamed him on Newsmax), a reporter named Chuck Ross of The Daily Caller, to try to turn conservative support away from Jerry and instead fill the coffers of Stone's defense fund. It is no coincidence that Stone writes for this publication, founded by Tucker Carlson and it is no coincidence that Carlson has been running interference for Stone on his Fox News Show, as late as last Friday, when he had both Roger and his friend Caputo on camera, following a hearing before Judge Amy Berman Jackson where she warned the defendant about showboating in an attempt in large part to obviously intimidate witnesses and pollute the jury poll. For this reason, Judge Jackson asked the parties to brief by this Friday whether she should impose a gag order on Stone. Let me be crystal clear here! Neither Jerry nor I have taken any action to harm Stone and if my client is subpoenaed to testify he will simply tell the truth, something Roger should have done. But Stone's attempts to intimidate Jerry by defaming him and his defense counsel, yours truly, smacks of the same type of witness tampering with which he is charged concerning Person 2 in the Mueller indictment. There Stone is alleged to have physically threatened, Meyer Lansky style, and even kill Credico and his dog. And this is why the "Real Stone Cold Truth" is that by attacking Jerry and me, Roger is giving credence to and compounding the crimes for which he was indicted. And, for this reason, on Jerry's behalf I will be filing this Friday an amicus brief arguing that in the interest of justice, Stone be gagged from defaming, threatening and attempting to influence and undercut the likely testimony of my client: commonly known as witness tampering.